In the Create campaign drop-down menu, select Display campaigns. Enter the campaign name. If you want to serve ads at a specific time, configure time targeting. Set the campaign start and end dates. Choose the Maximize impressions for lowest price strategy: it allows you to get the maximum number of served impressions over a certain period within the fixed budget. Set the average cost per 1000 OTS (“the equivalent of impressions” in outdoor advertising). Select the ad type — outdoor advertising. An ad group can only contain ads of a single type. Once you save an ad group, it is not possible to change the ad type. You can mix all types of ads in a single campaign. If you have configured frequency capping, it applies to banner and video groups, but it is ignored for outdoor advertising. On the ad groups page, click Add → Upload creatives. Download a video from your computer and enter the link to the website. To get the maximum reach, add several creatives to the ad group for placement on different types of advertising surfaces. More about requirements for creatives. You can gather an audience of users who have viewed your outdoor ads and then configure retargeting with it. You may address such users with new ad messaging or exclude them from your display audience. For example, to retain a loyal audience, you can set an increased bid adjustment for people who have seen your ads on digital billboards, and show them ads of specific products. Such users are already familiar with the brand, so they are more likely to choose your offer. Enable the Gather outdoor ad audience → OTS option. In Yandex.Audience, a separate segment is created automatically under the account hosting the Direct campaign. The segment name contains the campaign details. The segment accumulates users who were within the visual range when impressions were served on the advertising surface, based on location data. Click Advertising surfaces → Change. 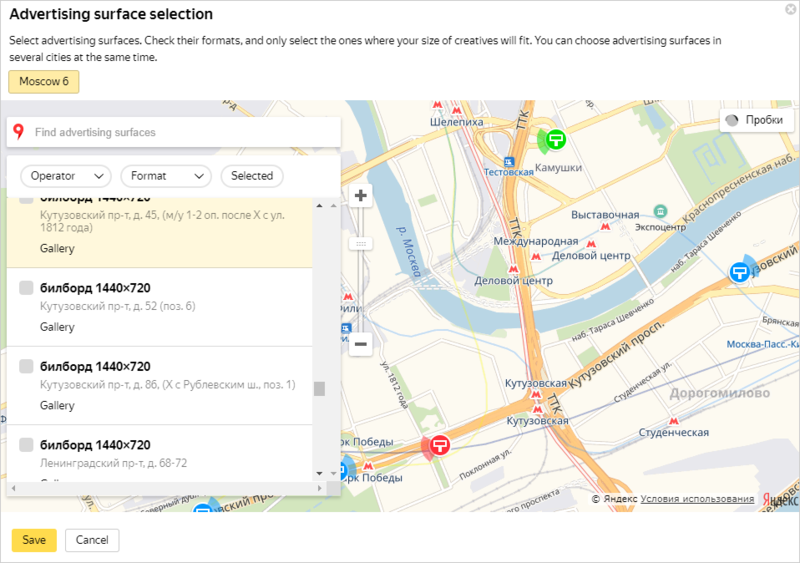 Select the advertising surfaces for your ads from the list, or click a billboard on the map to quickly navigate to a listed object. You can select surfaces in multiple cities at once. The selected advertising surfaces are marked green on the map. Attention. Check the resolution of the advertising surfaces and only choose ones that you have proper sizes of creatives for. For example, if you upload a 1440 × 720 creative, it won't appear on 1248 × 416 surfaces. You can also assess the traffic near the advertising surface by clicking Traffic in the upper-right corner of the map. You can view current data or statistics for specific days of the week over the previous two months. For example, in slow traffic, the audience passes the billboard at a slower speed. OTS is higher in these traffic segments. After you have created your ads, they are checked for compliance with the requirements and advertising rules. Click Send to moderation and confirm that you accept the Yandex terms for publishing your ad. Outdoor ads are moderated in two stages: first the creatives are checked by Yandex and then by operators of advertising surfaces you have chosen. Attention. Moderation can take up to 7 days. Your moderation results will be emailed to the address you provided when you created the ad campaign. If the moderation is successful, it takes several hours to upload the creatives to the advertising surface. Served impressions start only after you have paid for the advertising.